Concrete artistry is all the time more impressive. From overlays and stains to etchings and stamps, there are endless possibilities to the craft. Whether you need a beautiful addition to your home or a stylish entrance for your business, Concrete by Design can bring that vision to life for you. Your project will be in the best of hands with CBD, lead by lead visionary artist Leroy Brown. 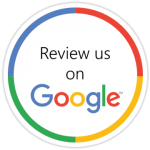 We use only the best quality materials; our prices are affordable, and our technicians are highly experienced and ready to serve you. In 2013, Concrete By Design, LLC was given the opportunity to place a bid for New South Construction. The job was for private Christian school Wesleyan School in Norcross, GA. The idea was to bring to life a “reading garden” for the younger children to enjoy. 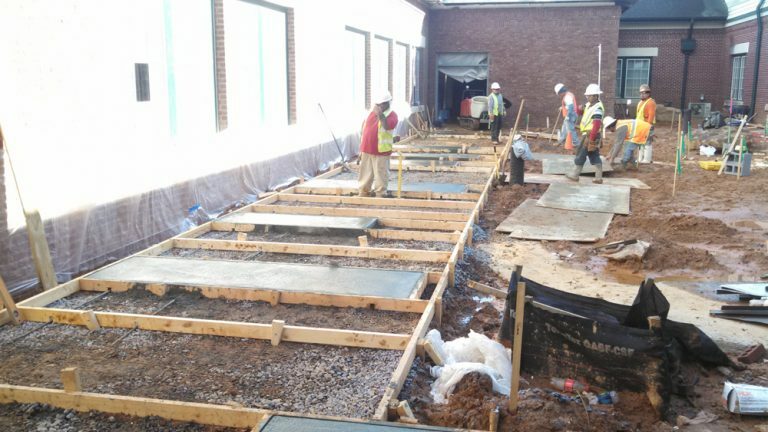 CBD, working with Dixie Stamped Concrete was granted the job. We were to create a place where young children could read, play and enjoy their surroundings. The project was two parts. A winding sidewalk was constructed for the first part, alternating between exposed aggregate and light broom finished integral colored concrete. The second part of this was a decorative bookshelf, with “A” and “Z” bookends. We had many options, from engraving book titles or using stencils with sandblasting. Vinyl adhesive stencils was the chosen approach. Call us To Throw Down Some Artistic Skills On Your Concrete! Concrete Makeover By A Concrete Artist! The first step was to form and pour the concrete for the bookshelf design. Each of the 26 books was different in size and color, so this process posed a challenge. Form boards were placed, to mimic the shape of a bookshelf, with spaces between for each color. The books also alternated in color, so more than one book worth of concrete was poured for each. Each separate color had to be mixed in different trucks and poured on alternating days, giving time for the previous concrete to set properly. 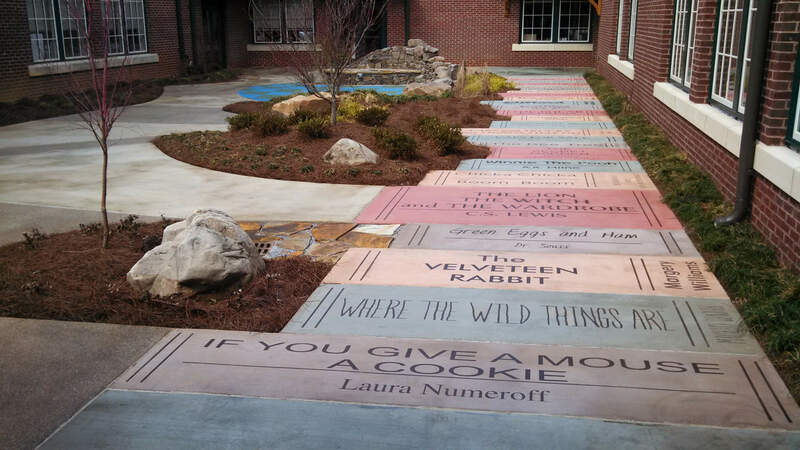 Vinyl adhesive stencils from Sign-A-Rama (Fayetteville, GA) were used to replicate the books, using varying fonts and sizes. We had to overcome several obstacles including weather changes and using space heaters to bring the concrete to the proper temperature and allow the stencils to adhere. Once this was done, the sandblasting was done, followed by blowing debris from the surface. Stain was applied, then the last step was sealing the surface with clear SurfKoat Acrylic sealer, to prevent bleeding of the colors. We were honored to be able to feature this beautiful project for our business. With so many color options to choose from, you will surely be satisfied with the end result. Stained concrete typically has two categories: acid-based chemical stain, and water-based acrylics. Acid stains are made up of hydrochloric acid and acid-soluble metallic salts. These components work together, penetrating the surface and reacting chemically with calcium hydroxide in concrete. Acid stain will etch the surface lightly, which lets the salts enter more easily. When the stain reacts, it is permanent to the concrete. It won’t fade, peel or chip. Earth tones such as browns, soft blue-greens and tans are the usual palette for acid stains. If you’d like a more vibrant selection of colors, you may consider water-based stains. There are even metallic tints available. 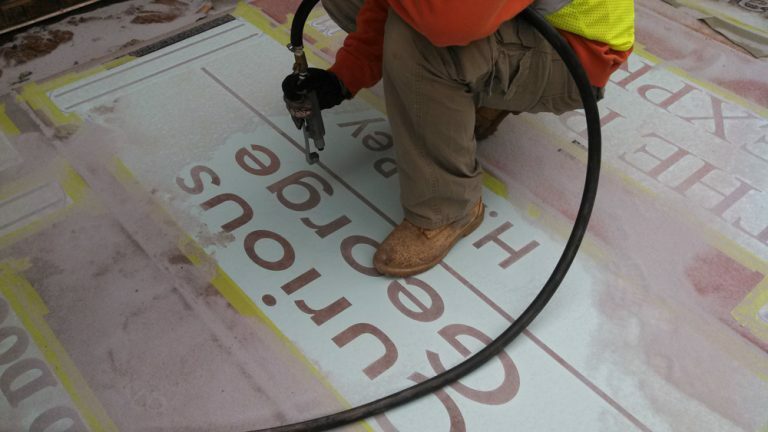 Just like acid-based stains, water-based stains penetrate the concrete, creating a permanent color, ranging anywhere from translucent to opaque. When choosing a stain, it is important to remember stains will not hide cracks for flaws. Stains must be able to soak into concrete, so that color saturation is achieved. They cannot be applied to surfaces that have been covered by anything that would inhibit that.